42 Palms Has it All !!! 5 Min Walk to Beach. 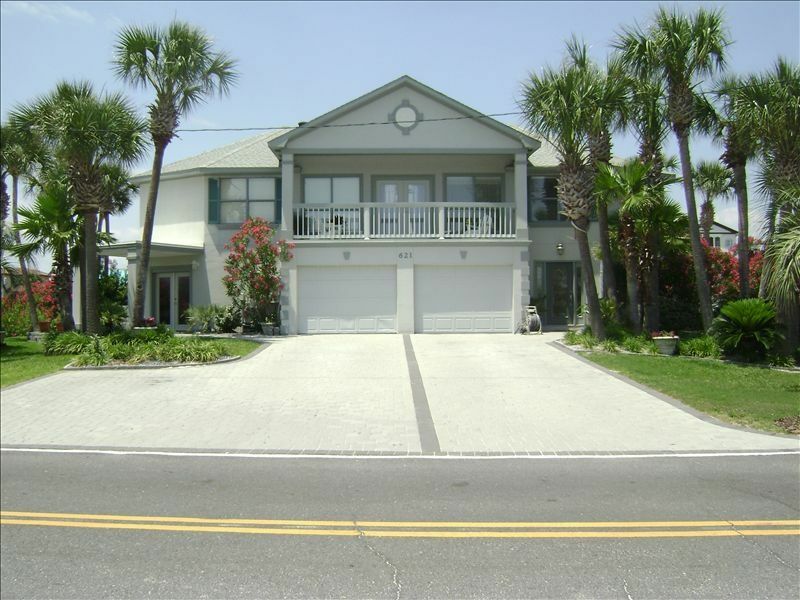 42 Palms is beautiful beach home and only two short blocks from the private deeded beach access. Drive the golf cart and yes it is included with the rental! This four bedroom home has been newly renovated and has it all! Boat slip, hot tub, private pool, pool table, foos ball and is luxury furnished. Come and stay at the beach with us at 42 Palms. Sit outside on one of the many decks. Listen to the gulf and feel the salt in the air. You won't be disapointed. 42 Palms is ready for you and your family to enjoy the ultimate Destin vacation. The home is pet friendly subject to a 25 pound maximum. Outdoor smoking only. Please remember to check our calendar before requesting a reservation. Hallway full bath on first floor and half bath on second floor in addition to the bath attached to master bedroom and bath attached to bedroom at end of hall on first floor. We are located two small blocks from the beach. You can see the flag flying and hear the waves. Located at the end of a canal. Park your boat on canal side tie up to 25 feet. Upper and lower levels individually controlled. All you will need are your beach towels. Large laundry room is private and located in the home. Large hanging space available in laundry room. Fully stocked kitchen. Service for twelve. Television in each bedroom, tv in both upper and lower living areas. (2) Huge balcony/deck in back upper level. Portion is covered. Large lower fully covered deck on main level. Relaxation deck on front of home. The owner of house keeps his personal boats in docks behind house and will frequently take them out. Access to docks is on left side of house along sidewalk. (4) Large pool patio with comfortable furniture. Heat sauna located in the home. Located in a covered area and private. Multiple decks and patios. Comfortable poolside tables and lounge chairs. Garage with electric openers. Beautiful Gulf of Mexico just two short blocks away. The house is big enough for several people. However, it's in need of updating. The dishwasher door is broken, cable pulled out of wall in one of the bedrooms, furniture and appliances need updated. The outside pool furniture was broken or the cushions were filthy and couldn't use. Yes there is a golf cart but can only go to the beach and back and is in poor condition. Appreciate the feedback on the house. The dishwasher has been replaced with a new one today and we have replaced the outdoor cushions with new ones today also. We strive to provide an enjoyable experience with the house rental, so thank you for communicating what needed to be improved. Lovely piece of property, close to everything, fit our family very well. Great location- pool, hot tub, canal access to the bay, private beach with golf cart. House layout is great for allowing some private time with a big group. Kitchen is well stocked. Having use of the golf cart made the short walk to the beach even easier for transporting kayaks and paddle boards. Paddling the canals to the bay was cool. The pool and hot tub were well maintained. There is some property maintenance in progress but nothing that interfered with our enjoyment of the house. Owner was easy to reach with questions. There was a lot of construction going on in the neighborhood, but it was not too loud or overwhelming. Destin had a lot to do and many neat restaurants. Renting a pontoon boat was fun to explore crab island and the bay. We had a great time staying in this home. Everything was perfect. The house is nice and the backyard is beautiful! Great location. Close to the beach and all shopping. The golf cart is a great extra bonus too. We will definitely be back! Loved this house!! Can't wait to come back! We had a great time staying here this past June. The house was nice and spacious, very well equipped, pool was great, and the beach is fantastic! Golf cart was really fun to have, and it made carrying coolers, boogie boards, etc back and forth from the beach easy - but it really is just a very short walk. The kids loved climbing into the canal off the side of the dock to look for conch and hermit crabs. Very responsive management and owner, great location but nice and quiet/private. I don't often write reviews, but this Vacation home is wroth taking the time to share our family vacation experience. The home has everything you need. It was clean, beds were comfortable, A/C kept the whole house cool, Kitchen has everything, game tables were in perfect condition, great home to keep your boat in the water. If I take my boat back to Destin, this will be my preferred destination! The golf cart to the beach was handy, but not necessary. If you like beaches that have plenty of room and not crowded then don't look no further. You don't see the beach, but don't be fooled because you really close. I've stayed in high-rise condos on the beach that took twice as long to get to a crowed beach. A perfect vacation in Destin-2014 4th of July !!! !